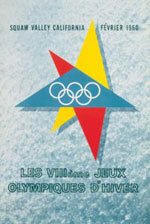 The 1960 Winter Games were held in Squaw Valley, an almost unknown, hidden valley in the Sierra Nevada. Speed skating was held on artificial ice and for the first time computers were used to handle the results. The women’s speed skating and the men’s biathlon were new Olympic events. The Norwegians did better than at Cortina. «Kuppern» (Knut Johannesen) won the 10,000 m in the legendary time of 15.46.6.